Today's guest post is by Pepppercommer and British citizen living in the US, Carl Foster. First, let me say congratulations. Your recent referendum and the overwhelming “yes” to remaining an Overseas Territory of the UK was a solid PR victory, not to mention a clear two fingers up to Buenos Aires. However, while I am merely an outside observer to an issue that you live and breathe every day, I do think a more definitive and longer lasting PR victory could have been achieved. I hear the Falkland Islands have highest proportion of internet users in the world. I would be keen to hear your response to the following thoughts. First, why a referendum? Why not a preferendum? You were asked “Do you wish the Falkland Islands to retain their current political status as an Overseas Territory of the United Kingdom?” Enough “no” votes to that question (there were three, right?) could have emboldened the Argentines and raised doubts as to your resolve. A preferendum would have allowed you to say whether you wanted to remain British, become independent, or become Argentine. The option to choose independence would have added credibility to the poll, as well as sending an even clearer message to Argentina, with that third option surely not receiving a single vote. More importantly, the option for independence would have strengthened the overall British argument about the Falklands. As I understand it, the fundamentals of that argument come down to this: The British say you have a right to self-determination; the Argentines say you are British implants and therefore the principle of self-determination does not apply. 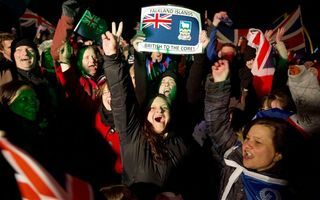 The referendum was the manifestation of that self-determination, yet after the result was announced, photos such as the one below were published claiming you were “British to the core.” To the outside world, for which the Falklands issue is just one of many in the news, I think this and the accompanying Union Jack flag waving kind of plays into the Argentine position. • Highlighting the economy and heritage of the Falkland Islands and your contributions to the world, even if these are relatively small things like wildlife conservation or asking that minefields from the war be left so minefield clearing resources can be used in other parts of the world. • Providing journalists with a phrasebook so they can see that the English spoken on the islands has unique words and phrases and has evolved over more than 100 years. • Asking all the hotels to serve meals that are unique to the islands. • Demonstrating at immigration that the journalists are not entering the UK but the Falkland Islands, a distinct and separate entity. In addition to this, I wonder if an infographic could have been created that demonstrates Argentina’s evolving position on the Falklands. As you all know, Argentine politicians use the Falklands issue as a nationalistic rallying call to divert attention from troubles at home. Using a tool such as Factiva, it could be possible to find the number of mentions of “Las Malvinas” in the Argentine press over the past 50 years and plot that against the country’s GDP, or some other metric. Providing a proof point like this to journalists would have further undercut the Argentine argument. More than anything, I think that US press could have been courted more aggressively. On the days of the referendum I checked CNN and Fox News as well as other outlets and I couldn’t see any coverage of the referendum on the homepage. As a champion of democracy and self-determination, you should have found a sympathetic ear in America, the country most able to persuade Buenos Aires that its efforts are futile. Of course, the reason they are futile is not because of the referendum, or any other PR exercise. They are futile because 255 British servicemen laid down their lives in 1982 for your liberty, something no one in the Falklands or the UK will ever forget. Nevertheless, the Argentine campaign for (or is it against?) the Falklands is a major issue. Cruise ships that dock in the Falklands are banned from Argentine ports and Argentina is threatening to sue any company drilling for oil and gas near the islands. I believe the result of the referendum will help your case on the world stage, even if I think a preferendum and a different media campaign could have helped more. Whatever the case, as this debate rumbles on, your greatest PR asset will be yourselves. 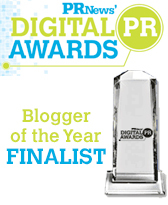 You are 2000+ passionate, on-message PR practitioners who are all connected to the internet. Keep getting out there and making your voice heard.